Offering 24/7 monitored burglary alarms and smoke detection systems.We are setting industry standards with wireless and easy to use scale-able systems.Our systems offer safety, piece of mind and the ability to live at home longer with our personal emergency response Pendants, watches, and bracelets. We personally design your home security system and install all of the products necessary to satisfy your home security needs. Listed on this page is a sample of our starter kits and some basic products that we can install. We provide and fully support many home security and fire detection products from a wide range of manufacturers. These include but are not limited to DSC, IDView, Honeywell (Ademco), and GE. Please contact us for more information.Your alarm system will include one keypad, more can be added and installed at appropriate locations around your home. These are used to turn the security system on and off, adjust settings, present important information regarding the status of your system, and call the authorities. 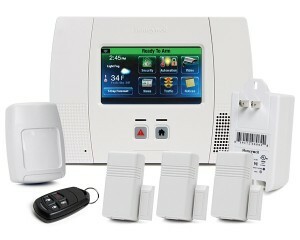 Also included in the starter kit is 3 door and window sensors, 1 motion sensor, 1 wireless keyfob.